Armament Research Services is proud to announce the release of the latest publication its Research Report series. Research Report No. 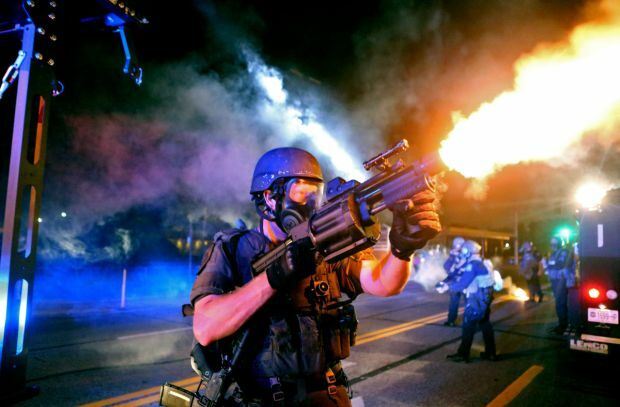 4: Less-Lethal Arms & Munitions Documented in Ferguson, Missouri examines impact and riot control agent (RCA) munitions employed by security forces during the 2014 riots in Ferguson. Authored by chemical weapons specialist Peter White and ARES Associate Researcher Stephen Semler, the report also provides a brief overview of the development history and employment methods of some common less-lethal munitions. These munitions are commonly employed by police and security force in their efforts to counter violent actions associated with civil unrest, and are commonplace in many countries. Recent riots in Baltimore have seen the employment of a range of less-lethal munitions, many of which are similar to those documented in this report. Remnants of less-lethal munitions recovered from the riots in Ferguson. Many munitions and their associated delivery systems are designed for crowd dispersal, and are often non-discriminatory and affect multiple targets. These are typically deployed in a less precise fashion than those intended to target a specific individual, in the general direction of one or more intended targets. These include various lachrymatory riot control agents (RCA), obscurant smoke grenades, stun grenades, and impact munitions. The munitions are generally used to disperse or deter a crowd, or are deployed in an area denial role. 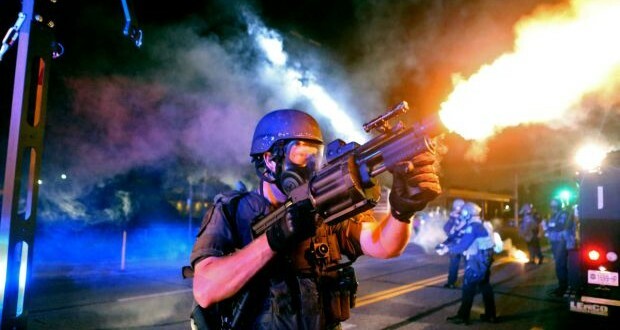 Target-specific impact munitions, including cartridges containing multiple rubber or wooden projectiles, have also been documented during the unrest in Ferguson. These are typically employed to effect the temporary incapacitation of a single target, although in some cases may be employed against aggressive groups. RCA munitions are typically of either the instantaneous or continuous discharge type. Instantaneous discharge munitions produce a comparatively small but highly concentrated agent cloud, almost immediately upon functioning. Continuous discharge munitions, often pyrotechnically actuated, release an agent cloud over time and are often more easily visible (see Jenzen-Jones & White, 2015). In addition to the thermal effects, the fact that these canisters can be projected to the target means that they also pose a kinetic impact risk to those targeted by these munitions. Many of the munitions documented in this report, such as Combined Tactical Systems’ Model 6230 CS hand grenade, feature an aluminium body (Combined Tactical Systems 6230, n.d.). The projectiles documented in Ferguson from our sample have a mass between 100 and 426 grams; a mass that can prove lethal if they strike a person in vital areas such as the throat or head (Bozeman and Winslow, 2004). In Sitra, Bahrain, there is evidence to suggest that two teenage males were killed after being struck with tear gas canisters in August 2011. Another fatality occurred in Duraz, Bahrain, when a 21-year old male suffered blunt force trauma from a tear gas canister in February of 2012 (Physicians for Human Rights, 2012). The predominance of less-lethal munitions intended for crowd dispersal rather than incapacitating individual suspects suggests that security forces in Ferguson considered crowd dispersal a priority. Additionally, the effective ranges of munitions designed to engage point targets are less suitable for maintaining a safe distance from potentially hostile crowds. For example, the effective range of the Combined Tactical 2581 Bean Bag Round is approximately 4.6-18.3 m (5-20 yards), compared to approximately 91.4 m (110 yards) for the 4230 40 mm Riot CS smoke. The frequency with which hand grenades (which may also be thrown) were fired from a launcher indicates that security forces sought to perform crowd-control measures at a standoff distance. Accordingly, almost all of the munitions documented in the annexe of this report — with the exception of the Cold War-era Smith & Wesson Riot Agent Grenade and the Combined Tactical Mini Flash Bang — are capable of being fired from a launcher. The full report can be read here. Other ARES publications can be found here.